After Harry Leslie Smith’s passing at 95 years old, UNHCR’s Lorey Campese recounts his discovery of the incredible activist. I met a man named Harry on the internet. I basically live on Twitter. It’s the first thing I check when I wake up in the morning. It’s my news stand. It’s how I know who to start in fantasy football. And it’s how I earn a living and pay my bills. I’ve seen great leaders and trolls, diplomats and the odd cat. I’ve seen clickbait that promised things that would shock you. Sometimes it delivered. But I never saw anything like Harry. Harry Leslie Smith was a lot of things. He was a soldier in the Royal Air Force during World War II. He was a father, an author, and a 95-year-old activist. I heard about Harry through a chance video by UNHCR Canada that painted a brief picture of his life and what he had done for refugees. From seeing the faces of those in flight during World War II to his pledge to tour the world meeting refugees in his final years, Harry was a fierce advocate for the refugee cause. The video led me to another article that portrayed Harry meeting those who fled in Calais. Which led to another article of him speaking to university students in Manchester about displaced people. While the students were seven decades his junior, they appeared to listen like he had the secret to life. Another article rightly described Harry as a (then) “woke 94 year old.” After hours of googling and Twitter searches, I was touched and inspired in a way I hadn’t been in a while. All because of a man named Harry. I began writing this a few days ago when Harry was hospitalized after a fall. He assured his more than 250,000 Twitter followers that it wasn’t anything serious. Just low blood pressure. Over the course of the next few days he fell critically ill and his son took the reins of his social media, providing nearly round-the-clock updates on Harry’s condition. Each night since then, the last thing I’d do before I went to sleep was check Harry’s Twitter page. Each time, I was hopeful that the world would get one more day. Maybe he’d recover and we would quite a few more days with Harry. I felt the world needed that. I think the millions who virtually joined his son at Harry’s bedside through the online vigil probably felt the same. A quick scan of the headlines on any given day tells you why. Wars are more frequent, longer, and more intense than at any point in recent history. Innocent people are being driven from their homes at a break-neck pace of one person every two seconds. It’s occasionally said that here are more people displaced now than at any other point in time since World War II. First as a member of the Royal Air Force, and later as an advocate, Harry was one of the few people on earth who saw both pieces of this tragic history. And he chose to do something about it. When he was face to face with refugees traveling south in Nazi Germany, he gave them the little food he could. When he met refugees in the last years of his life, he used his voice to move the world. Sometimes his stories were told in soft-spoken words and through teary eyes. He’d recall what must have been vivid scenes etched in his mind. Other times he called for action with fervor. 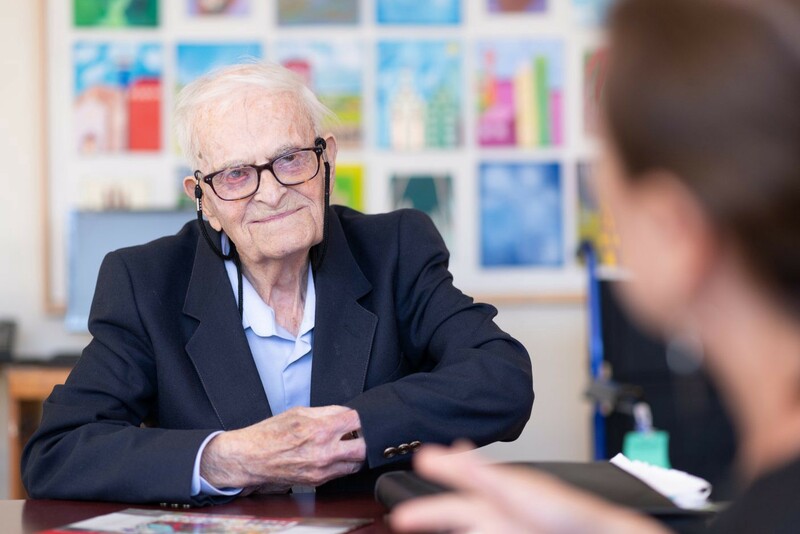 Today, Harry Leslie Smith passed away at the age of 95. In a person’s last hours and the days that follow, there’s a natural time for reflecting. Reflecting on what a person did with their life. Remembering how many times they laughed, recalling their stories in great detail, and wondering about missed opportunities. I think this is half because all of these things instill a sense of pride and half because they need to be said out loud before the details fade even one shade. In a moment of reflection from his hospital bed, Harry asked his son perhaps the most important question there is in life. Harry wrote books, he traveled around the world, he picked up causes that were bigger than him. He has taken on fights that were worth fighting, even if they were bigger than any one person. Harry listened. And perhaps most notably, when he saw injustice, when he saw the plight of refugees… the familiar scene that he first observed six decades earlier in the ruins of Europe… he took a stand. Harry’s last stand may have come to an end. But the things he stood for are timeless. The battles he took that earned him the moniker of ‘World’s Oldest Rebel’ are far from over. I met Harry on the internet a matter of weeks ago. I’m in no way qualified to point out the greatest achievement in this courageous man’s 95-year life. But if I had to guess, the hope and inspiration that he provided and will continue to provide to millions around the world must be high on the list. And that’s something that mattered. Lorey Campese is global social media officer for UNHCR in New York City. Follow him on Twitter @Lorey.